Almost like a pair of tongs and a peeler in one, this specialized tool will make it easier than ever to remove the skin from skinny vegetables like carrots and asparagus. The handle part is made from a spring steel with a chrome finish, and the blade is made from stainless steel. The lower side of the handle has three rounded grooves, and the upper part is home to a vertically aligned blade with a remarkably sharp edge. The shiny finish will allow veggies to glide back and forth without resistance, but the indentations will make it impossible for them to roll to the side. When you gently squeeze as you grip the tool, your carrots, asparagus and other foods will be held securely without any risk of damage. Instead of struggling to maintain a good grip, or fumbling as things slip, you will be able to peel food to perfection with increased speed and accuracy. It doesn't matter how tapered or skinny each vegetable is because the advanced design of this tool will allow you to work with anything without frustration or damage. Because it cradles food from the bottom as you peel the top, you can apply the perfect amount of pressure, and thin pieces can't bend and flex out of the way. It's made in Switzerland using the best materials available, and with a quick modification it can be used by right or left-handed people. Thanks to the materials used, clean up is easy, and this tool is totally dishwasher safe. Gentle. Asparagus can be easily ruined, so it requires a very light touch. This tool offers one of the best ways to gain control without risking damage. Sharp. A ridiculously sharp edge has added micro-serrations to further reduce friction and improve cutting ability. Glide through hard carrots or anything else like a hot knife through butter. Grippy. Grab onto food to prevent movement and make it easier to remove skin without frustration or ruining the food. Slick. The shiny coating looks pretty awesome, but it also serves a purpose. With almost no friction against your food, sliding it back and forth will be effortless. Fast. The sharp edge combines with the slick surface to increase your peeling speed without compromising accuracy. Guided. Align with a groove as you clamp down, and your carrot or asparagus will remain in the groove as you move up and down to take off the skin. Simple. The effortless operation and intuitive technique is easy for anyone. It will not strain or tire as you work, and it doesn't require excess effort, or practice to achieve perfect results. Dishwasher Safe. Don't worry about hand washing or any special maintenance because this tool is totally dishwasher safe. Swiss Made. Unlike other Swiss kitchen tools that are made in China, this one is still made in Switzerland. This is the perfect tool for peeling long and slender veggies because it gives you an ideal blade orientation, a wide grip, and a way to guide food, and prevent movement. The blade can pivot to conform to changing surface texture and overall shape, and the tong-like handle allows you to grab on with the perfect amount of pressure, while holding food in place on the bottom. 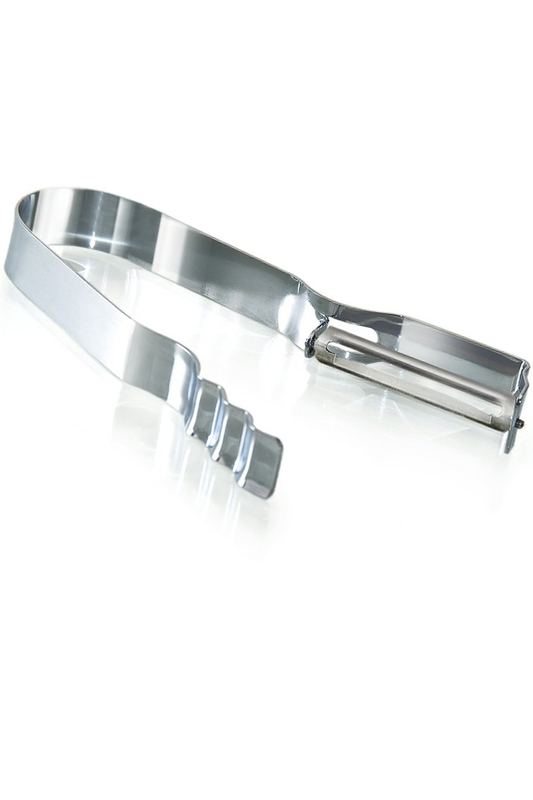 Because the handle is wider than traditional peelers with vertical blades, it will be more comfortable for everyone, but for those with arthritis and strength problems, it will be invaluable. Stop worrying about your veggies rolling away, and don't mutilate another pierce of asparagus by using the inferior tool you have now. Get this affordable alternative to reduce the time and effort this job takes, and improve your results at the same time. Compatibility Left or Right Handed - remove blade and switch orientation. Tongs and a peeler in one. Gently hold long vegetables and then peel them to perfection. Unique design prevents movement, and the super sharp blade removes skin with speed a precision. Order Yours Today! I have the potato peelers and use almost daily. This peeler is good for what it is for but I don't always peel carrots but does work well when I do. High Quality, Swiss Made Vegetable Peeler With a Super Sharp Blade. A High Quality Corn Kernel Stripper. Take Corn Off The Cob!